It has been a fun and rewarding journey for Localscope as it has matured over 3 years and 27 upgrade releases. One of the most rewarding aspects have been the thousands of interactions we have had with our customers, the users of Localscope from all over the planet. This has taught us a great deal. Due to the nature of the app, Localscope is used in more demanding situations and locations than we could have imagined when we first conceived the app. While it feels highly gratifying to be told first hand in multiple occasions that Localscope has helped save a life or been of assistance in dire situations, it also makes us feel responsible and motivated to improve the app. Its been 15 months since we decided to step back and fundamentally redesign Localscope to make it faster, more powerful and yet simple enough so our grandmothers could use it. We’ve completely deconstructed and re-created Localscope more than once in this time. The introduction of iOS7 further inspired and enabled us to create the experiences that we have been dreaming of for a while. We are very proud of the outcome. 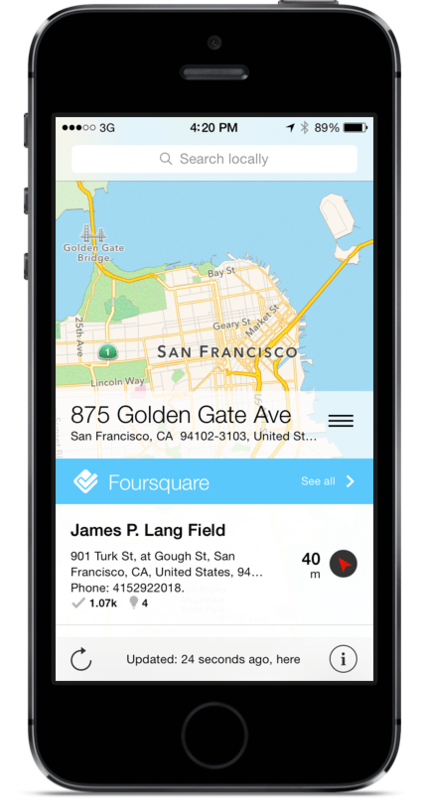 Localscope 4 is the biggest update in its history and completely redefines the concept of a location browser. The dashboard view lets you see everything thats immediately around you from all of Localscope’s sources. It presents a couple of the most relevant results aggregated from the sources in a beautiful unified view. Scrolling the dashboard unveils place listings from Google, Facebook, Yelp and others along with tweets, Wikipedia pages, pictures from Instagram, Flickr and more, all from your immediate surroundings. This is made possible with the newly designed intelligent parallel query engine that gets results automatically from all services for a smooth and fast browsing experience. Search is now integrated into the dashboard and shows results from each of the services in one unified view. From the dashboard you can drill down to seeing more results from any of the services using the revamped full list, map and augmented reality views. We love the new iOS7 and we have taken deference, clarity and depth really seriously. Even though we have increased the base feature-set of Localscope, it now feels much simpler to look at and use. The interface focuses on disappearing and content gets the highest priority, seconded by context. The entire application interface is designed with subtle transparencies and overlayed on top of a blurred map of the users current location or the location in context. We have used depth to communicate geographic context and also provide a subtle color tone to the entire application thats unique to the current location of the user. Much of this complete UI redesign is instigated and inspired by the awesome iOS7 and enabled by its new APIs. The new and simplified my location screen is now integrated into the dashboard. The current location map forms the background for the dashboard, giving a geographic context to the results overlayed on it. You can simply tap on the map to change your location or check the GPS signal for accuracy of results. The source slider has been the cornerstone of the classic Localscope user experience. With the new design, the source slider provides instant switching between the sources and only presents services that have results saving you some precious seconds. The Localscope icon has been very well known and loved thanks to the the awesome artwork done by SoftFacade. To communicate the spirit of this huge refresh we decided to rethink it again.We’ve redesigned the app icon based on the new iOS7 philosophy using Apple’s icon grid layout. It’s been simplified to communicate its most essential form and little else. Even though we are very fond of the old icon, we think the new icon is better at its job. Since user feedback has been one of the biggest inspirations to this redesign, we have decided to offer the upgrade free to all our users instead of creating a separate app. There is a lot more nifty new features in Localscope 4 that we would love you to discover and tell us your thoughts. For a full list of changes take a look at the version history on the App Store.